Matt Jackson has informed TTwebsite that he will not be able to take part in TT2002, after sustaining injuries during practice at the North West 200. The incident which prevents Matt's participation took place on Tuesday night while he was out qualifying on his 250, after a couple of great runs on his 125 and the new 600 he was hoping to ride in the Production Races at the TT. I suppose that it really comes down to a combination of cold tyres and bit of a hot head, after feeling that I had done quite well with both the 125 and the 600 in practice, says Matt. 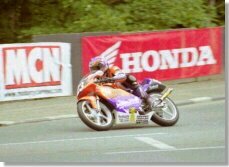 The 125 was going like a train and I was clocked at just one second behind Chris Palmer. (who was clocked fastest), through the speed trap, I qualified in eighth overall myself and felt that I could certainly improve upon that when the race started. Of course I'll never know, but Chris went on to take second in the race itself, so if I hadn't come off, I feel that I could have been up there with the leaders in the actual race. The 600, considering that it was my first time out on it, gave me good ride and I felt very comfortable on it, I was looking forward to getting to grips with it in the race, in preparation for an assault on the TT circuit, but of course that will have to wait another year. The damaging incident was the 250. After feeling very good about practice on the 125 and 600 I went out with the 250 and lost it at Primrose Hill, with (what I can remember), the bike flipping me and I ended up sliding along the road with my left hand trapped underneath me. The next thing I know is that there is a Travelling Marshal/Doctor beside me and I have to say a great big thanks to him for his extremely prompt and professional action. I was taken to hospital in Coleraine where I underwent so many inspections and x-rays, I thought that I would end up glowing green in the dark if they took any more shots of me, however the staff at the hospital were brilliant and I thank all of them for the care and attention that they showed to me. The damage sustained has left me with a broken collarbone and three fingers on my left hand now all the same size, losing one knuckle on the ring finger and one and a half on the middle finger. Merv White and Dave East visited me while I was in hospital in Coleraine, and hey guys, many thanks for doing so, when I know that you were up to your necks in it with other things at the time. It really was appreciated. On Wednesday morning I was transferred to Dungannon (I think) Hospital where they specialise in the repair of the type of injuries that I had received. There I received fantastic care from the staff who treated me brilliantly, and again I cannot thank them enough for what they have done for me. On Friday afternoon I was released from hospital, being picked up by John Wilson (Monstermob - many thanks John) and returned back to the paddock, intent upon watching the racing at least, even if I coudn't take part in any of it. My Pre TT entry at Billown will now I think be given to Roy Richardson, who will have a beautifully prepared and really quick Alex Whitwell prepared 350 Honda to play with. My 250 ride at the TT will be given to James Crompton and the 600 ride to Steve Rathbone, who I am hoping will do well with it, as I feel that it is a great bike. The 125, well I'm keeping my baby in the garage for later in the year when I am fit and ready to return and hope that I can get a few good outings under my belt, before the season ends. I would like to say a great big thank you to everyone who has provided me with help and assistance over this past week, especially all of the hospital staff, and to Merv for showing me just what a professionally organised meeting the North West is. Now it only remains for me to say, Chrissy Grose, - go out and win the 125 for me this year as I would like to see nothing better than you on the podium instead of myself, as you deserve it mate. See you all soon at the TT somewhere around the paddock folks, and don't be afraid to come on over and have a chat.